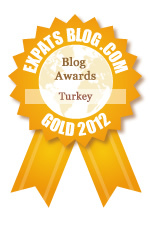 It only took us three years to do something nearly every first-time tourist does in Istanbul. Before we moved from Istanbul last year, we made a bucket list of things we still wanted to do in the city. One of those items was riding the historic tram that trundles down the pedestrian-only Istiklal Caddesi in Taksim. 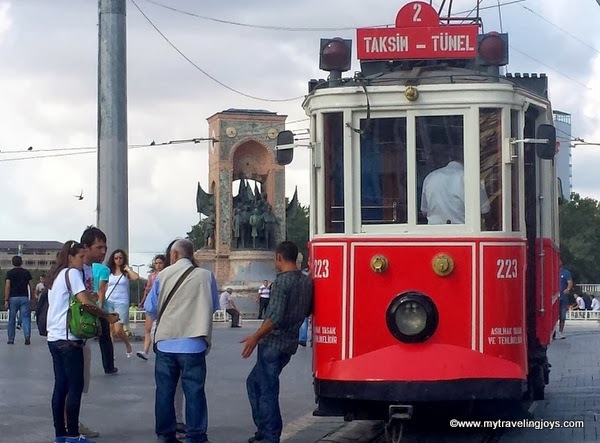 You cannot miss the historic Tünel Tram in the Taksim neighborhood in Istanbul. I always pooh-pawed the idea of taking this tram. For one, it’s always crowded; and two, it was something ONLY tourists did. I was never a true tourist in Istanbul. I moved to this historical, cosmopolitan city in 2010 as a first-time resident, newly married, and without ever seeing it in person. Of course, I ended up doing many touristy things over and over, especially when friends came to visit us. However, riding this tram was never one of those things. Not riding this tram while living in Istanbul perhaps is comparable to never setting foot in Times Square if you had lived in NYC like we once did. The historic red and white Tünel Tram runs down Istiklal Caddesi (once called the Grand Rue de Pera) from Taksim Square to Tünel Square – a distance of 1.64 km (1 mile). The tram was first introduced in 1875, taken out of service in 1961 to be replaced by buses, and was revived again in 1990. Today, the trams carry an average of 6,000 passengers daily! If you do decide to take the tram, I can’t promise you will arrive at your destination any quicker than if you just walked the 15 or 20 minutes. The ride is relatively slow as the conductor must constantly ring the bell to make the pedestrians move out of the tram’s way. 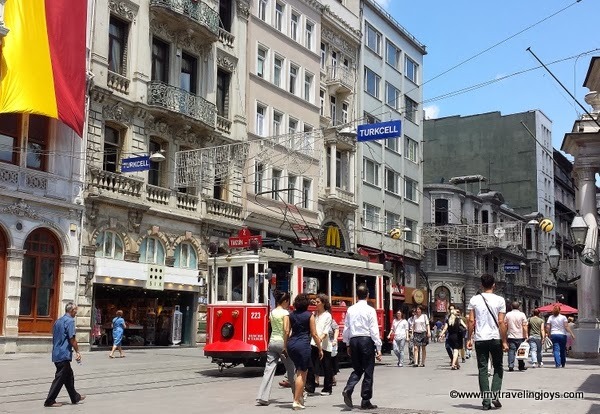 However, the ride offers tourists and residents alike a quick view of life on Istiklal Cadessi, and maybe you will shave a few minutes off your commute. 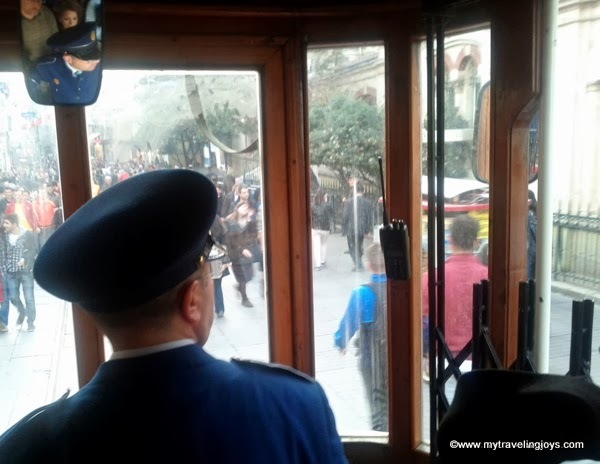 For us, riding the historic Tünel Tram was just another item crossed off our Istanbul bucket list! If you’d like read more about Istanbul during the late 1900s as the Ottoman Empire was waning, I can highly recommend a historical fiction book called, The Sultan’s Seal by Jenny White. Her book follows the main character, Kamil Pasa, a magristrate over the Pera and Galata neighborhood, as he tries to solve a murder mystery. The book goes into great detail about the old neighborhoods of Taksim, Galata and Pera. It’s a fantastic read! “A horse-drawn tram clangs along the (Grand Rue de Pera), carrying matrons from the new northern suburbs into town for shopping…Kamil surveys the early morning bustle of Istanbul’s most modern quarter. Apprentices balance nested copper tins of hot food and trays of steaming tea, hurrying toward customers waiting in shops and hotels…,” excerpt taken from The Sultan’s Seal. I've never ridden the tram either - time to correct that I think.